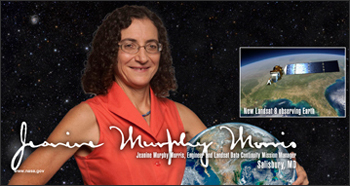 Apr 2, 2013 • Aerospace engineer Jeanine Murphy-Morris has always been interested in flight, and that interest propelled her into a career building Earth-observing satellites. As a college student, she joined the Air Force ROTC program. After graduating from the University of Maryland, College Park with a degree in aerospace engineering, Jeanine was assigned to Vandenberg Air Force Base, Calif. to test missiles. In Feb. 2013, she returned to the base for the first time to witness the launch of the satellite she helped guide into being. Morris started her NASA career 20 years ago in Fort Wayne, Ind. The job came about, she says, when she was asked to give NASA officials a tour of Cheyenne Mountain Air Force Station. “The tour became a job interview,” says Morris, and soon she had an offer to join NASA as an instrument manager for the GOES satellite program. As instrument manager, she oversaw the development of new instruments for the GOES series of weather satellites. In her 10 years in Fort Wayne, Jeanine saw the delivery of seven sets of instruments for seven GOES satellites. Morris moved to NASA Goddard Space Flight Center in Greenbelt, Md. in 2002 to become the instrument manager for the primary instrument on the Landsat Data Continuity Mission (LDCM), the Operational Land Imager (OLI). After delivery of the OLI, she became the observatory manager. Morris oversaw the development of the interface between the satellite structure and the two instruments that fly on LDCM. She managed the contracts with the private companies that built the spacecraft and the OLI. After a decade, the LDCM successfully launched from a familiar place, Vandenberg Air Force Base. With a father in the Air Force, Morris spent her childhood moving from place to place until junior high school, when the family settled in Salisbury, Md. She attended Wicomico Junior and Senior High Schools, and often returned to Salisbury throughout college. Salisbury was the first place Jeanine felt she could call home, and she still has family and friends in the city. What would she tell students in her hometown? “The first question in my interview to work at NASA was, ‘What is your degree?’ When I said aerospace engineering, it got me to the next question.” Training in aerospace engineering is especially valuable at NASA because it encompasses many branches of engineering, including electrical, thermal, structural, and material engineering and aerodynamics. “An engineering degree opens many doors. It has served me well,” says Morris. This entry is filed under News, People of Landsat.